It’s Sunday Funday! And I think that made me realize that I have a problem. When I went back and checked my phone after class, I realized I had almost 10 videos that I took during class. All of which I thought were awesome! Since I can’t pick which ones are the best, I still uploaded them all to my Smashby Training YouTube Channel. While I won’t post them all here, feel free to check out the channel and view them there! Today’s workout was inspired by the Tahoe Throwdown hosted between Rogue Fitness and Again Faster Equipment a few months ago. Some of the best CrossFit athletes in the world were put in the same place for a week or so, and all they did was hang out and work out. Sounds pretty awesome, if you ask me! In teams of 3, every athlete picks up a bar from the ground. 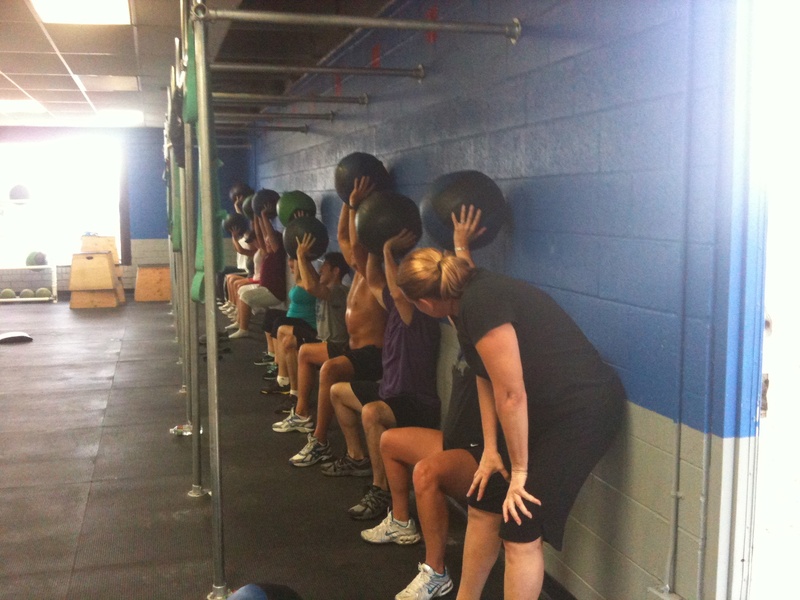 While only working one person at a time, the athletes must complete 50 total reps of Front Squat. 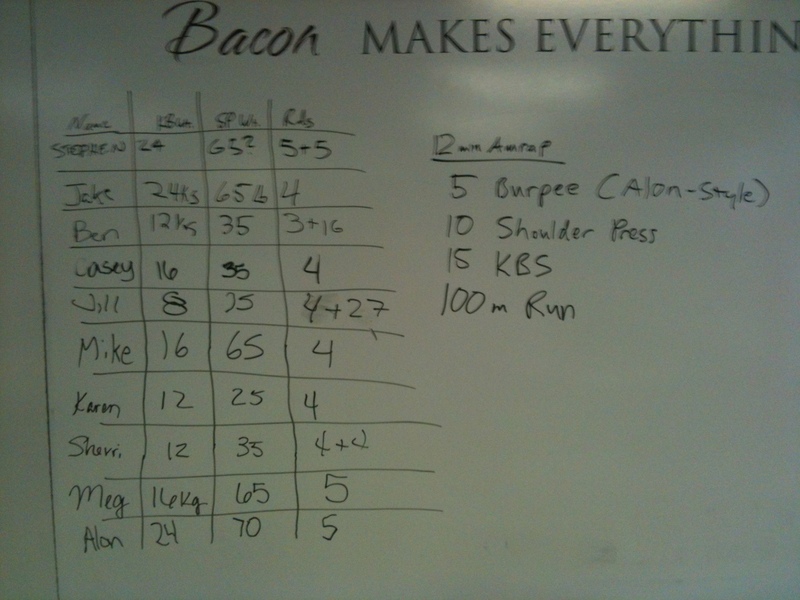 BUT, if someone had to set their bar down, the entire team had to do 5 burpees! 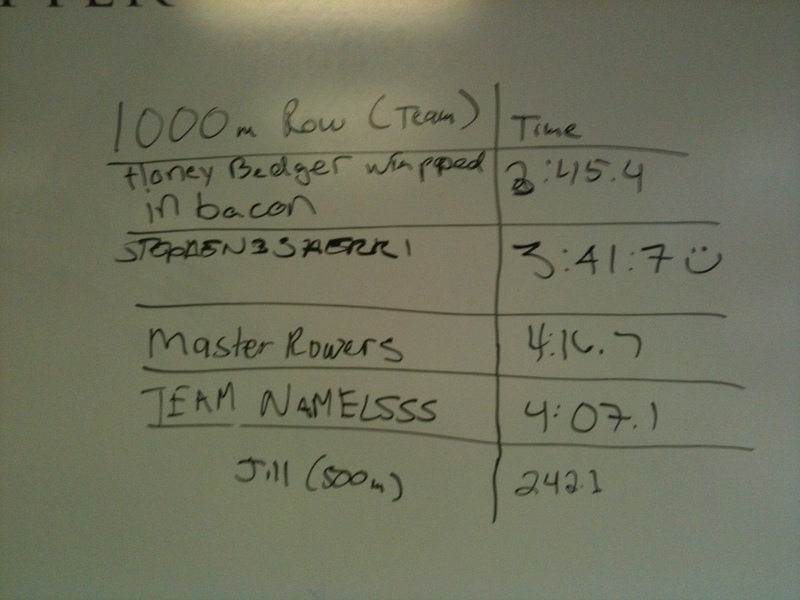 After that, the team worked together to row a total of 3,000 meters. Once that’s done…. do it all again for a second round! I’m really proud of how well you guys did with this, and the teamwork was awesome. After that, we had a little dessert for the first time in a while. At 3 different stations, the team was to select one person to complete as many reps as possible of one movement (they were sit-up, push-ups and air squat). The team with the most reps at the end of 3 minutes was named the winner. Thanks so much for Mike Davis for coming down and hanging out with us for a Sunday Funday! 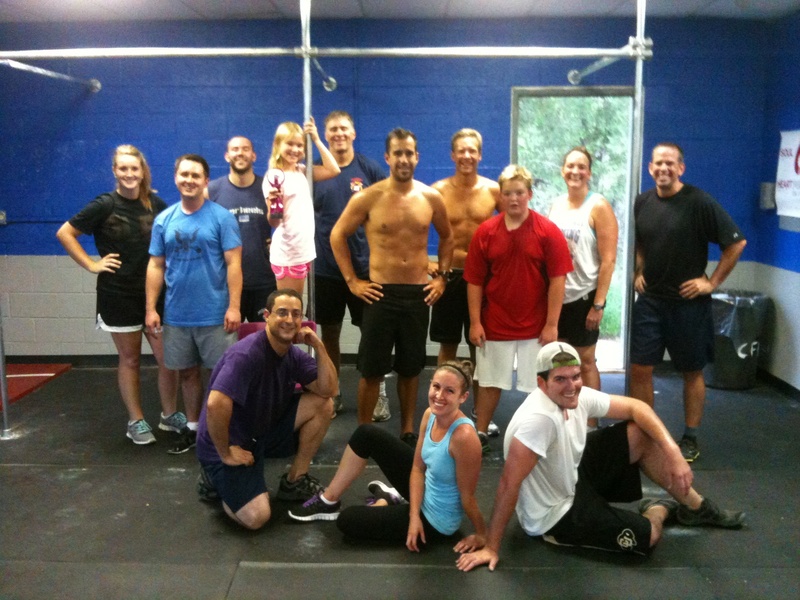 And thanks to all of you for making Casey’s final Sunday Funday workout before she leaves for COLLEGE a great one! We miss you already, Casey! 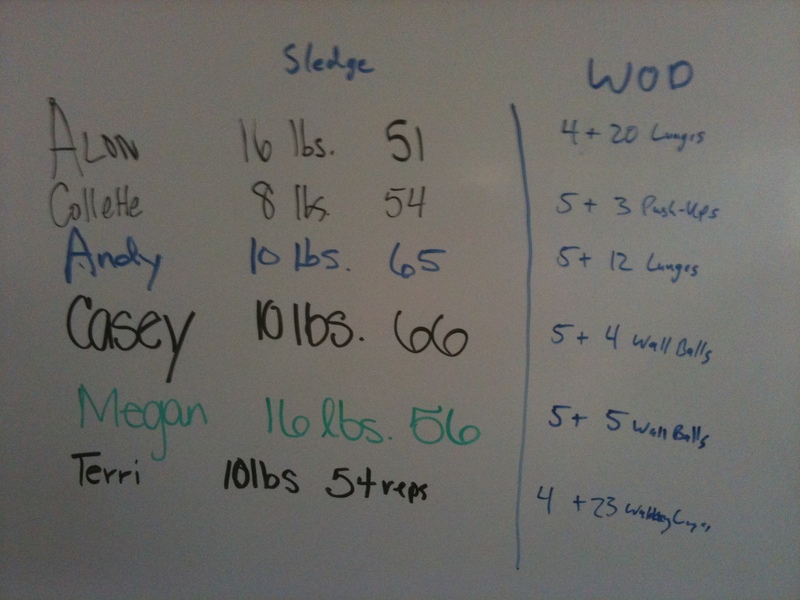 Looks like some burpees got dished out towards the end of Round 2’s Front Squats! 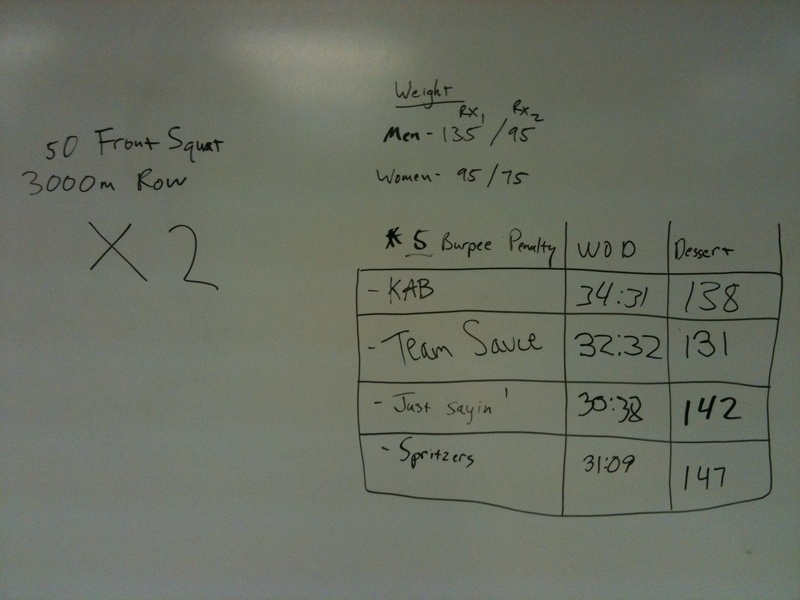 Here’s the final transition on the rower as team KAB finishes the workout. 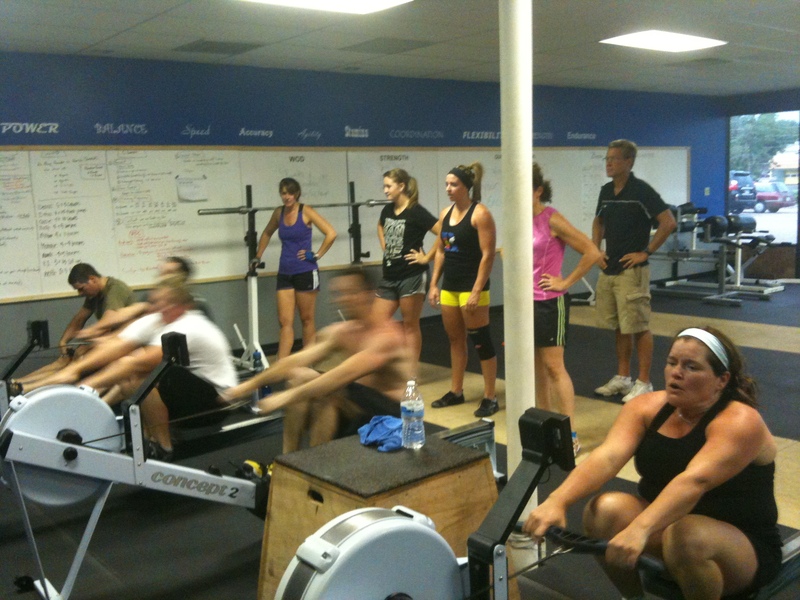 I LOVE the support from everyone else, and Kip’s fight on the rower! Finally, a “Dessert” video. One minute of max Air Squats. In case you’re wondering, no. This video is not sped up at all. Those guys are really moving that fast! WOW. We got a little crazy today, I’m not going to lie to you. I told you guys that our time together on Sunday would be “constantly varied.” Tonight was definitely varied, wasn’t it? Either way, you all did an amazing job of pushing through! Feel good moment of the day for me was watching Wes and Casey (father and daughter) finish the workout together. You guys are so awesome! Aaaaaaaaand, here are your results! See you guys next Sunday! As always, we try to keep it classy on Sundays, and today was no exception. During the week, we had a few people request some fun with tires. Well guess what, you got it! 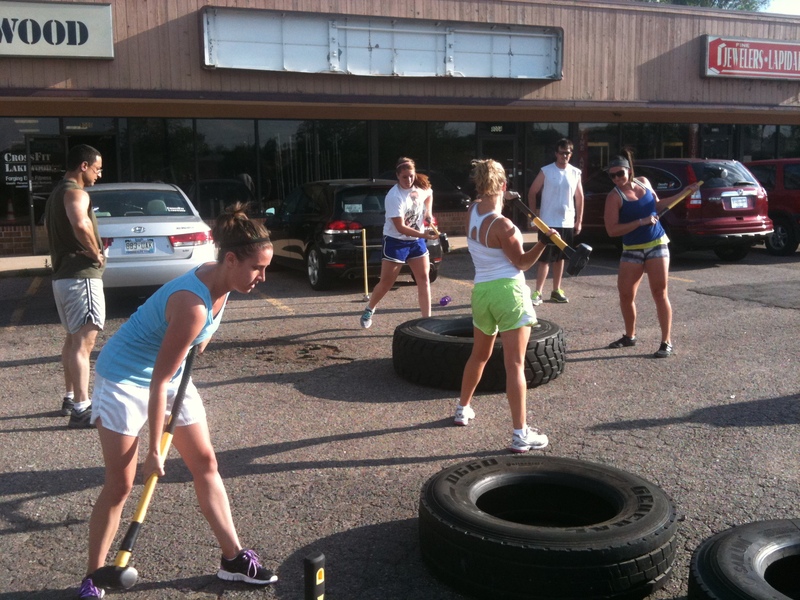 It was the first time that some people had ever even worked with a tire, so that was fun, too! Then, we continued the “Time Trial” test that we started last week. 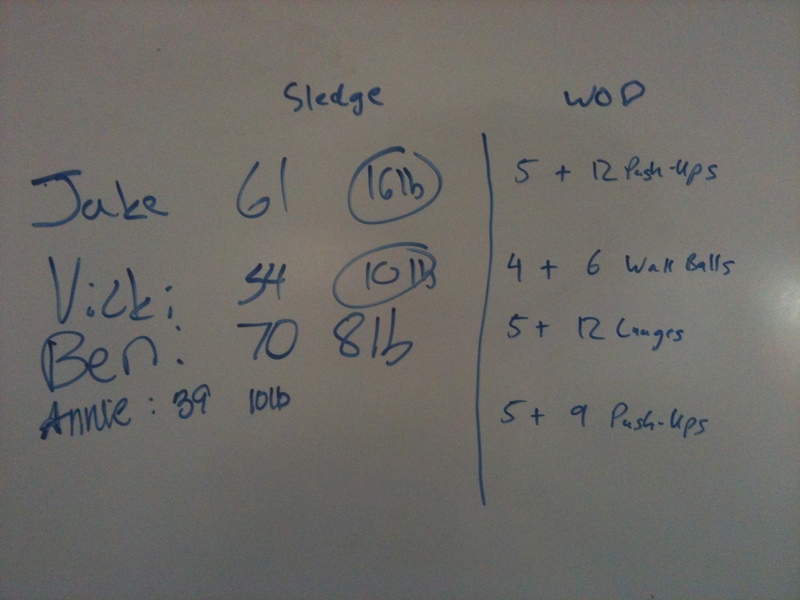 This week’s event… sledge swings! It was also the first time that some folks had ever used a sledgehammer. As usual, though, you are learn SO FAST and picked it up so well. NOW it was time to head inside and get to the main WOD of the day. For only a 12 minute workout, people said they were pretty fried after this one. I was guessing the shoulders would be worked pretty well with THREE arm-intensive movements! Great job, everybody! For the results today, we’ve got both the Max Sledge Swings AND the number of rounds each athlete was able to complete during the Workout.